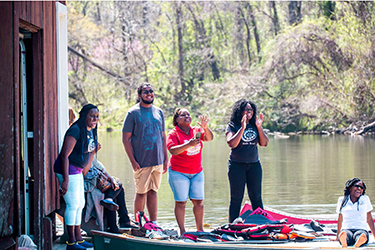 Joshua Regrello raced across the surface of Sweet Briar’s Lower Lake on a stand-up paddleboard, just a nose-length behind Briana McCall ’17. And, when McCall followed her paddling exploits by executing a headstand on the board, Regrello tried it, too — and tumbled into the water. He gave no outward sign as his band mates laughed from their perches on the Boathouse dock, but surely the water, so early in the Central Virginia spring, felt chilly to the Caribbean Islander. No matter. There were laughs and banter and plenty of selfies. There was a lot happening at Sweet Briar College last week, especially musically. Nineteen core members of Trinidad’s renowned Skiffle Steel Orchestra and their leader, Junia Regrello, came to campus to teach, perform with and get to know their U.S. counterparts. 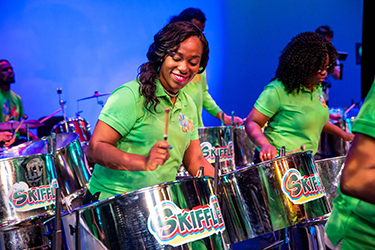 Sweet Briar is home to Skiffle USA, the only international branch of any major steel orchestra in Trinidad based at a college or university. The visit, which took place April 9-16, is part of an ongoing collaboration between Regrello and Skiffle USA founder and leader Jeff Jones. An associate professor and musicologist, Jones established the Sweet Briar branch in 2013 to create ways for his students to learn “intercultural competencies.” This was Skiffle’s second weeklong visit to campus; the first happened in 2014. By competency, Jones means acquiring knowledge and skills that lead to productive engagement in multicultural contexts. It’s an “actionable” knowledge of another’s culture that can only come from lots of interaction together. Skiffle members enjoy their band mate’s antics. Click for more photos. Jones began building that kind of relationship with Skiffle and Regrello more than 10 years ago as a Ph.D. candidate. Studying the special role of steel orchestras in Trinidadian society, he lived among Skiffle’s players, performed with them and was invited to be an honorary member. At Sweet Briar, Jones became interested in collaborating with Skiffle in ways that benefit both his students and the Trinidadians through cultural exchange. So, last week’s schedule was packed with an intentional mix of work and play. Skiffle USA players — both students and faculty — took master classes with their guests. They golfed. They ate bagels and attended Latin and engineering classes, and just hung out. And they practiced together. There were two big concerts, one in Murchison Lane Auditorium and another at Amherst’s Second Stage in the first full-concert performance by Skiffle United!, when both groups took the stage. Trinidad and Tobago is a twin-island republic in the Southern Caribbean, just off Venezuela’s coast. It’s the birthplace of the music known as steel pan, thanks to the country’s petroleum-based economy. Pans are a 20th-century invention — instruments improvised from discarded 55-gallon oil drums. Pan is a way of life in Trinidad, says Regrello, who was recently elected mayor of San Fernando, one of Trinidad’s largest cities and Skiffle’s home base. As a local leader and former minister of culture, he is keenly aware that pan is not only a source of national pride, it serves a public good by bringing people together. It took Regrello a while to fully appreciate it, but that effect of social cohesion on individuals in Trinidad was the focus of Jones’ doctoral research. Skiffle of Trinidad practices during the visit. Click the image for more photos. For Trinidadians, Regrello says, the music is spiritual. It grew accidentally, after all, a natural byproduct of Trinidad and Tobago’s rich oil resources. Its importance wasn’t lost on Kayleigh Bekisz ’20, who just started learning the genre this year. “They have steel pan in their DNA,” she observed after spending as much time as her scheduled allowed with Skiffle. Senior Brea Marshall — a founding Skiffle USA member — already stays in touch with several Skiffle players through Facebook and Snapchat. She even played in their San Fernando practice “panyard” last spring when she traveled with Jones and classmate Alex Dagher to Trinidad to attend a conference. She says this year’s visit felt more about getting to know Skiffle outside the music than 2014. Still, the panyard in Babcock’s lower level was a frequent hive of music making. Beyond technique, there was a lot to learn — such as Skiffle’s arrangement of Taylor Swift’s “Shake It Off” in preparation for Thursday’s concert.